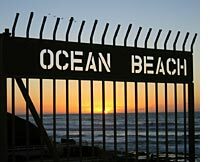 Ocean Beach | San Diego's Funky O.B. Ocean Beach, or O.B. as it is affectionately called, is one of San Diego’s funkier beaches. Here you’ll find people of all types enjoying the sun, surf and sand. You’ll even get to let your dogs take part at Dog Beach located here. Ocean Beach is a sleepy town where you’ll find funky shops, local cafes and restaurants. Very few chains find a home here and that’s the way the locals like it. Stepping into the community of Ocean Beach is like taking a step back into time. The Sixties influence can be felt here. It’s a friendly mish-mash of people from all walks of life. The beaches of Ocean Beach are fantastic. From Dog Beach all the way to Sunset Cliffs you’ll find stretches of white sand, awesome waves and gorgeous sunsets. Surfing and tidepooling are popular as are volleyball, Frisbee and fishing from the OB pier. Dog Beach is a stretch of beach on the north end of Ocean Beach located just south of the Mission Bay channel. Here dogs are allowed to run free. Scoops and trash cans are strategically placed for the owners to clean up after their pets. Believe it or not, the beach is cleaner than you might think! As you park in the parking lot, you’ll see a huge paw print marking the entrance to Dog Beach. You’ll think Clifford the Big Red Dog was here. This beach is wide with plenty of room for the dogs to run on the sand or to splash in the waves. Further south is the Ocean Beach Municipal Pier. Here you can enjoy a nice stroll or fish without a license. A restaurant sits at the end of the pier for a unique dining experience. 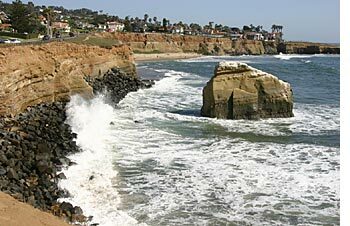 Sunset Cliffs is a rugged stretch of beach that’s popular for exploring tide pools or for paddling out and surfing. This surf spot is fantastic but vigorous. It’s rocky and treacherous. Multi-million dollar homes line Sunset Cliffs Blvd but are on the inland side of the road. The beachfront has trails and benches for enjoying the fantastic views. Ocean Beach is a hip and artsy community and an all-around fun place to be.